With the economy heading south for the winter, the time to stretch every penny is upon us. I find myself now making sure to use every last drop of milk, saving every last piece of chicken thinking that I can use it as part of my lunch the next day, even using my tea bags twice or reheating old coffee just to save a few bucks. The funny thing is, that it actually feels a little rewarding to find new, inventive ways to pinch the penny. So, after successfully baking TWD Kugelhopf and having two or three slices of it, I was left staring at a whole loaf of Kugelhopf that was almost destined to make it to the trash. 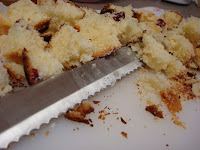 Not that I wanted to throw it away, but I just couldn't eat that much Kugelhopf on my own! When I thought all hope was lost for my little friend, a spark of hope glimmered in the distance. That spark of hope is called bread pudding! That's right! 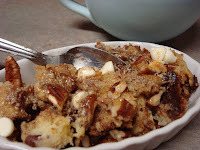 I took my crusty three day old Kugelhopf and turned it into a White Chocolate Pecan Bread Pudding. 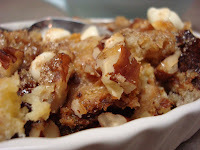 Since cool dark nights are swallowing the sunshine of my day earlier and earlier, I couldn't think of anything better to cuttle up to than a warm bowl of bread pudding. And kugelhopf is actually a great "bread" to use, it was crusty on the top, but light and custardy throughout the center. To all of you out there who are battling these tough times, I raise my spoon to you and say Show Them What You're Made Of! Because we are a nation, a species, a world who have overcome many, many tough times. We will make it through this, just as we have before and come out on top, stronger and ready to face a new day! Combine milk through eggs in a bowl and whisk together. Place Kugelhopf cubes into 8 inch baking dish coated with cooking spray. Pour milk mixture over Kugelhopf. Press down on bread to absorb the milk mixture. Sprinkle white chocolate chips and pecans over top. Cover with foil and refrigerate for 30 minutes. Preheat oven to 350 degrees. Place baking dish in a 13x9 pan, add hot water to pan to the depth of 1 inch. Bake, covered, for 20 minutes. Remove foil and bake and additional 10 - 20 minutes, until wooden skewer comes out clean. Combine water and brown sugar in saucepan and bring to boil over high heat, stirring until sugar dissolves. Boil for about 10 minutes, until mixture is reduced to about a cup. Remove from heat, and whisk in the cream and cinnamon. 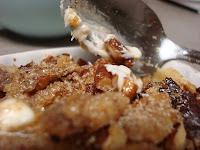 Keep sauce warm and serve over warm bread pudding. Oh my, this looks heavenly. Bread pudding is the best.